rec. June 1997, Antroposofernas Haus, Järna. Wilhelm Peterson-Berger is best known for his songs and piano music, evocative of nature and reminiscent of Swedish folk music. These same qualities are also preeminent in his five symphonies and in his other large-scale works. While the symphonies lack the structural cohesion and emotional heft of those of his contemporaries Stenhammar and Alfven, their more intimate qualities have brought them many admirers. The Andante is a different matter. Here the two main themes are used to construct an impressive elegy, with stirring use of brass and percussion. The music eventually becomes more gentle, but no less elegiac, somewhat in the manner of Alfven’s Drapa. The final movement begins allegro and features some excellent orchestration. It gradually slows to a largo with the return of the Banner theme before ending energetically. Thirty years after The Banner, Peterson-Berger wrote his last completed symphony. This was begun not long after the composer had left his activities in Stockholm for a rustic retreat on the isle of Frösön. 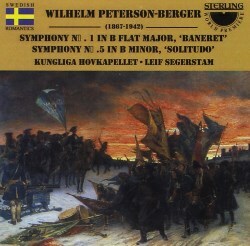 Although titled Solitudo (Solitude), Peterson-Berger claimed that this did not refer to his withdrawal from Stockholm. Whether this is true or not, the music definitely breathes the feelings of nature evoked by the composer’s new place of residence. The feeling of peace and quietude is further emphasized by the symphony’s tempo markings – “tranquillo” for three of the four movements. The first movement is genial and quickly breaks into several related motifs – all typical of the composer. They finally coalesce in a quiet ending. The scherzo was described by the composer as a conversation among friends and this is evident in the alternation of its three themes. The Andante is a sort of hymn to nature and becomes steadily more serious – quite the most impressive music in the symphony. It dies away into the last movement – a series of vigorous dances which too die away into a tranquil ending. Leif Segerstam possesses great understanding of Peterson-Berger’s unique mix of love for the natural beauty and for the folk-culture of Northern Sweden. In this sense his versions of these works are slightly more moving than the comparable ones by Michail Jurowski (CPO). The Royal Opera Orchestra in Stockholm also shows greater feeling for the music than those of Saarbrücken Radio and Norrköping. But Jurowski’s recordings are part of his complete set of the composer’s orchestral music (review), which most admirers of Peterson-Berger will probably wish to have.